This evening, February 10, 2012, at 9:50 pm, our dear Oksana passed away. Heartbroken as I am, I must nevertheless continue caring for the many cats here at the sanctuary (my residence, that has been transformed into an animal sanctuary for the un-adoptables). We do not have the luxury to stop working to grieve over Oksana’s passing, so I thought that the best homage to our Oksana while helping to placate our pain was to commemorate her on this page. Oksana was truly a special cat. Naturally all cats are wonderful and special, but Oksana was special in a different way. 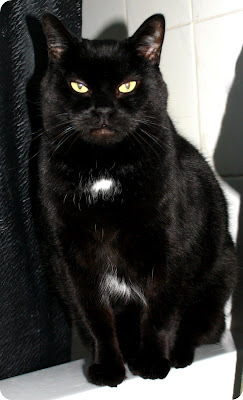 When she came to us, Oksana was the type of cat that pounds do not hesitate for a moment to kill: a black (therefore less likely adoptable), adult, unspayed cat with behavioural problems. Oksana was found in the middle of the winter of 2002 in front of a portable used as the headquarters of Wild Care, a wildlife rehabilitation center that unfortunately has since closed its doors for lack of funds. Oksana had been abandoned in a red carrier with an open can of tuna. Corinne, one of ORA's co-founders, used to religiously volunteer for Wild Care every Sunday for an intense four-hour shift of cleaning and feeding wild animals. That particular Sunday, as soon as Corinne appeared at the door of the portable to get her assignments for the day, she was handed the red carrier with Oksana in it. ORA had not yet been founded at the time, and Corinne was naturally considered the most appropriate candidate to care for Oksana. It soon appeared that Oksana had suffered from major trauma and/or abuse. She was terrified of human hands. We could not even place food in front of her without being fiercely attacked. But we did not consider even for a second to “euthanize” Oksana. We just felt terribly sorry for her, wondering what ordeal she might have endured to be so terrified of human hands. We learned to feed her wearing skiing gloves. After months of care and loving words, Oksana came to understand that she could start trusting us. Oksana started feeling more comfortable in our house although adopting her out was not an option as she would still react with aggression to sudden movements of our hand. Oksana also learned to accept the many felines coming and going. She did not establish friendship with any of them and regarded them as competitors for our attention, but she learned to tolerate them. Then in 2008 Oksana was diagnosed with breast cancer. A biopsy identified the cancer as being of a particular aggressive type, but we persuaded the reluctant vet to perform a mastectomy. The vet cautioned us that the cancer could return. It did in fact return two years after the surgery and since then it has continually grown larger. However with holistic remedies, large administration of vitamins and supplements and local application of ointments, Oksana was able to keep the cancer at bay for another two years, living, against any forecast, well for four years even after cancer diagnosis and surgery. It is astonishing that the same Oksana who did not even allow us to place food in front of her when first she arrived here, swallowed then, every day, for four years, without even a bit of resistance, all of the pills that I administered to her. She allowed me to place her upside down on my lap to spread the different holistic unguents on her tumors. This procedure was always followed by a brief session of pats and kisses and I will never forget the grateful look in Oksana’s eyes. It is like she understood that I was trying to do my very best to help her to live. And Oksana fought with me to defeat her cancer, but we both failed, although our tacit collaboration prolonged Oksana’s life for four more years. At midday today, Oksana ate half a can of A/D (highly caloric prescription diet food) and this afternoon she ate a bit more food and some treats and as usual she accepted the administration of vitamins and supplements. At 9:30 pm, I saw her sitting on my bed. I gave her a big kiss, then I went downstairs to replenish some cat dishes with new food. When I arrived upstairs, a few minutes later, Oksana was laying down, breathing heavily. I took her in my arms to help her feel more comfortable for a while, but then she suddenly passed away. Our Oksana is no longer with us. Animals always teach us something if we are perceptive to learn. Oksana’s death, happening now while we are organizing the Nathan Winograd event, while we are trying to raise awareness amongst the general public about the horrors of thousands of animals being killed in pounds every year in the GTA is like a validation of our assertions: Oksana had ten great years with us because we did not give in to clichés. She was entitled to her life and we respected her right to live. Nobody has the right to terminate a life under any excuse whatsoever. So called “vicious cats” are made that way by humans and with human love they can become the most docile and lovable animals. We will miss you tremendously, dear Oksana. We are glad and honoured that you came into our lives and that we had the privilege to care for you. You have taught us so much. I will miss the loving look of gratitude in your eyes when I was caring for you. Have a good time on the other side of Rainbow Bridge and befriend some kitties there until we can be reunited again. In memory of Hamilton Animal Services victims Treena and Britain, two cats who were never given the chance for a new loving home. An online vigil was held to honour their memory on April 29, 2011, at http://on.fb.me/iXw2p0. ORA thanks everyone who joined us in mourning the loss of 2 lives that might have enriched someone else's. The vigil has come to a close now, but we will hold it every year on April 29th to remember not only Treena and Britain, but every animal who is put down without a chance at a new home every day in pounds and shelters throughout North America. They will never be forgotten. Please join us again next year, and join our Cause now to stop the killing. Thank you friend, for being a part of my life. We met ten years ago when I moved into my new house in Toronto. A year later, you adopted me and for the next nine years you were a good friend, loyal companion, and boss of the house. I miss you meeting me at the door on my arrival home from work, chatting away in your beautiful voice about your day, and sitting in the garden together on warm summer days. You will never be forgotten. Nina, you were so little and delicate, but your mind and your will were. I will always remember your small head with oriental features, your quiet demenor almost belonging to another world, your soundless meowing that penetrated deeply into my heart, your sweet and acute eyes that spoke volume. So little, yet so strong: together we fought for your life , your determination supported my determination, but in the end we both lost the battle. Your short life left an indelible mark and a painful emptiness. We are consoled only by the thought that you were much loved by all of us and you died peacefully amongst friends. We and the other kitties are missing you. Melanie especially cared for you and Sunny fell sick when you died. May your sleep be restful and peaceful until we will meet again. May all our love, dear Nina, be with you in the afterlife. in Paradise my dear friend. Ivan was a beautiful gray tabby with gentle eyes and a wonderful disposition. I met Ivan 15 years ago when he came to my doorstep. I knew when I first laid eyes on him that he would become part of my family. He will be greatly missed, but never forgotten. Kiri, we are missing you so much: we miss your curious look, your growling when you disapproved of something, your joyous excitement around food. We tried to make your staying with us as pleasant as possible to make you forget the previous life of abuse that caused those serious health problems that finally claimed your life. Everybody loved you here, the other kitties, who tolerated without retaliation your habit to play with their tails and the dogs that often endured a light swat when their canine exuberance disturbed your long naps. You became a little spoiled kitty, somehow every cat and dog here felt that you deserved special consideration. You will be in our hearts until we will be reunited.